Miami Beach’s Planning Board voted yesterday in favor of a condo planned by Crescent Heights on Alton Road. Four separate yes votes are still required before the project can move forward, including two commission votes. 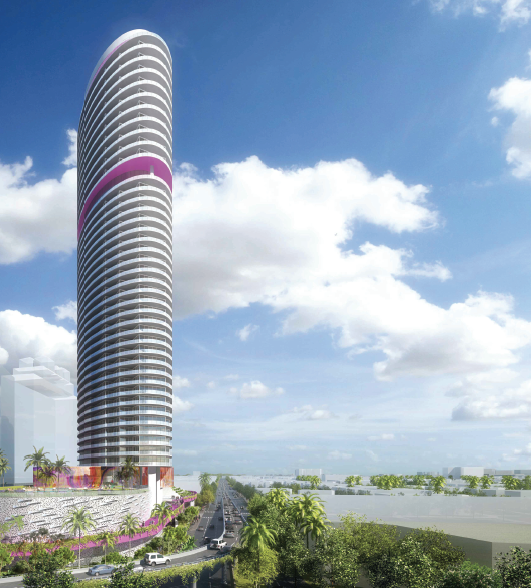 The tower is proposed to rise 44 stories, or 484 feet. It will include 410 luxury condos and 15,000 square feet of retail. 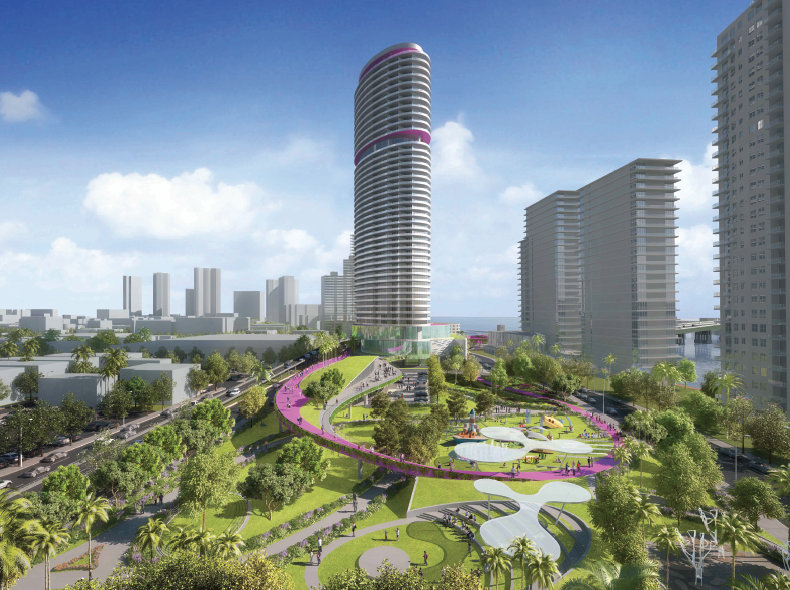 Crescent Heights would build a 3 acre park with a pink elevated pedestrian path for the city, as part of the deal to allow a much taller building than normally allowed. 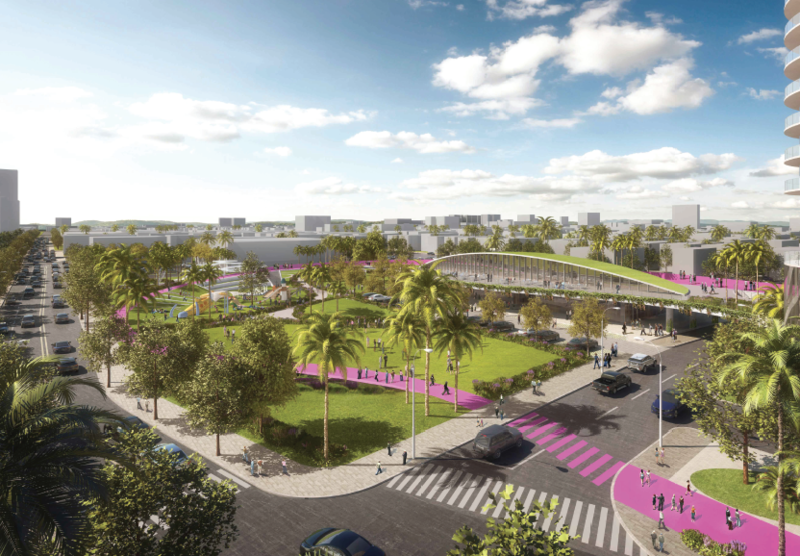 A pedestrian overpass from the South of Fifth baywalk would also be built, along with an extra turn lane on Alton Road to the MacArthur Causeway. Raymond Fort of Arquitectonica is the architect, according to the SFBJ. How tall are the other South of Fifth condos? While this may be taller, it’s not like it will be the lone tower for the area. 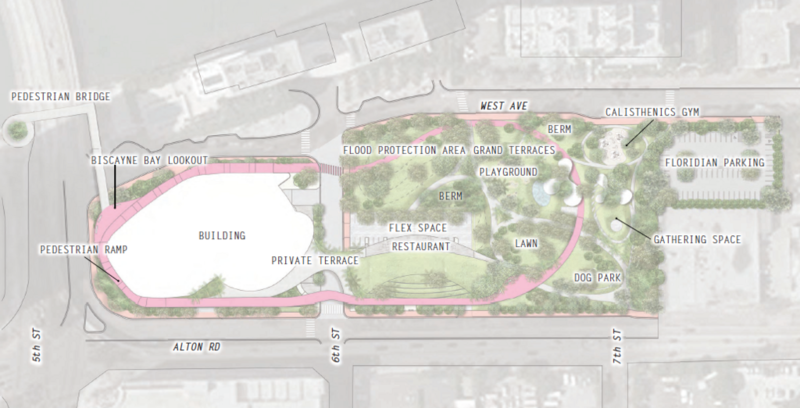 Allowing for a taller massing & gaining new park-space seems like a no-brainer to me. Otherwise, they’ll build something shorter that covers a larger portion of the site they already own, with less benefit to local residents. The difference is those towers are on the water. And the zoning was different for those. This tower is a) not on the water and b) is zoned for 70 feet. Indeed, it’s a block east. But it’s not like the properties across West Ave are single-family homes, it’s flanked by neighboring condos an a big-box retail cluster to the east. Crescent will build something here regardless, but this seems like their most logical proposal yet. Icon South Beach is 42 stories/423 feet tall. Murano Grande is 41 floors/407 feet tall. This proposal is slightly taller but not out of scale in my opinion. I find this proposal much more preferable than a massive hulking midrise that stretches across multiple blocks. Thank you. Albeit taller that its neighbors, it seems appropriately scaled for its surroundings, regardless of current zoning. It’s a shame those towers cover the view. Otherwise, this would be a beautiful sunset view facing west and overlooking the entire skyline. I’ll tell you what though, the proposed condo tower might have the best views in town of the city skyline. Miami Beach doesn’t need any more vancouver type empty high-rises for investors. The low rise project was much nicer and would fill the struggling restaurants with residents. Yeah, he gets his own reasoning. 440 condo units, which maybe 80% will sit empty most of the year, further contributing to a dead spot in the otherwise bustling south beach neighborhood. Funny how the “Free Market” is not what it’s supposed to mean to some of you people. The developer gets the same amount of space and number of apartments but stacks it vertically in one tower instead of spreading it out over multiple blocks, and the city gets the difference as a 3 acre park. Doesn’t sound like too bad a deal. The kicker is that in the vertical configuration the city will probably have much LESS permanent residency. So lots of taxes from temporary occupants who aren’t trafficing through the congested Mimia Beach streets and demanding services. A pedestrian bridge would be great for the area, but I wouldn’t get your hopes up. It’s only drawn on the site plan, & not included in any current renderings. Seeing how it would span over the MacArthur, something iconic from Calatrava or similar would be ideal (but obviously increase project costs greatly). Why not design the intersection to be pedestrian friendly in the first place? Agreed. 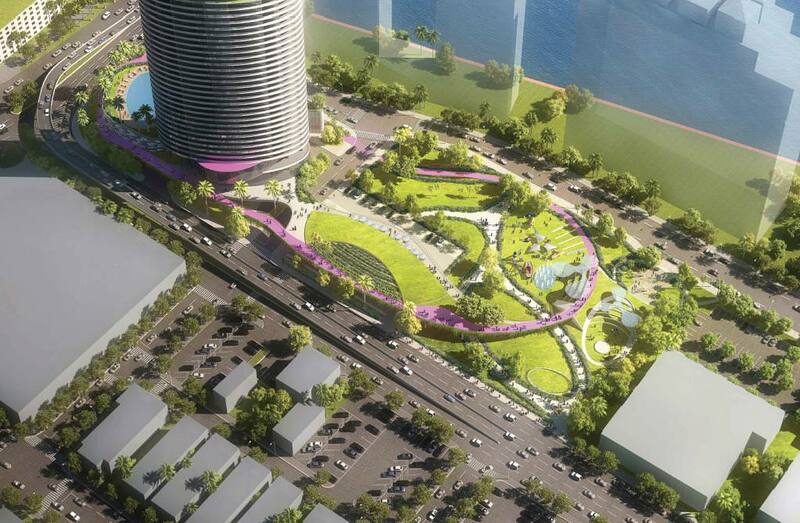 Tear down the flyover – and build the 500 Alton project at human scale. I live right next door to this and I think this is probably the best only because it’s free park space. While scalewise I’d like a mid rise, I think quality of life will go up with additional park space in that area. Also the other buildings nearby are all high rises, so pushing for a mid rise as a preference doesn’t make sense. This is the most logical proposal with the greatest public benefit. The area is already active and park space would just attract more people to the already busy restaurants nearby. I wish we got something like this on the School Board site also by Crescent Heights, as opposed to what looks like a twin tower prison. I’d be very wary of the plan/renderings which show adding multiple lanes to Alton and 5th Street. The last thing we need is more space devoted to vehicles. The roads as depicted are how they are currently, and this project doesn’t change them in any way. When it was a hi-rise y’all complained when it was low-rise y’all complained! Now it’s back hi-rise y’all still complaining! I’m convince this site should be called The next complaint! The whole premise was that the original approved plan of 500 units was too “intensive”. Yet here we are with a 500+ foot tower, with 440 units – with 20% of them being hotel units. Sounds like we have the same intensity… just the developer gets to make a whole lot more $$$. What difference does it make how much money the developer makes? It seems like he was providing the city and residents with a 4 acre park, where before, it was just mid-rise condos over four blocks. Sounds like a great trade-off for me. I live in the building directly across the street, and we are all very excited about this being developed – because what is there now is a nightmare. Hopefully NIMBYs don’t destroy it. What happened to the transit station that was suppose to be inside of it.. The 500 Alton project promotes equity and building resilience. Anyone against this is misguided and uninformed. This will be an example for coastal cities around the world!!! What’s resilient about building an empty condo building? It’s being sold as occupied only part time by the developer. why do the renderings make it appear as the tower will have unobstructed views of the bay…there is a tower sitting right there on the bay.??? and how many units will be devoted to lights out nobody home owners who are hiding/parking money..?? If you put your glasses on the can see the towers are there but it’s just the image. The render wanta to draws attention to the project an not other buildings! Aventura transplanted in one of Miami’s most human-scale neighborhoods. Yes Miami needs more parks, but taking out an entire city block at this location seems ill advised. Everyone bitching about midrise density — yes, this is what makes the great cities of the world. Cohesive street walls with activity concentrated on them, and then layers of public and private gardens and alleys and squares laced throughout. Instead we’ll just have another dead block surrounded by cars speeding onto and off of the MacArthur. But as long as it’s another dumb uninspired concrete phallus, the commenters here are elated. But then if I don’t like it I guess I should build my own! the approved mid rise apartments would do wonders for the area. instead we’ll have another dead spot as you mention. 515′ tall? 500′ high? How high is this tower? I oppose vacating 6th Street. I want a bigger park. Where do you see 6th Street being vacated? The 3rd render clearly shows cars passing through, with the pedestrian pathways above it. It needs to be in order for the FAR to be transferred from the other parcels. What does the south end really look like from the street? any evidence to back up those explosive claims? Just go to the meetings where frank and gayle run into the back rooms with the city officials. Everyone in the neighborhood wants them gone. The grounds/park look very nice. The height is completely out of scale with the area. The project has greatly improved over the years. Its a similar height as the surrounding buildings to its immediate west, sw, and nw. I’m afraid you’re incorrect. It’s 100 feet taller than building to south and over 200 feet taller than buildings to the west. Probably 300+ feet taller than building to the east. Who cares?.. Jesus, they’re all just buildings that people live in. If they’re empty – are people living? Wrong wrong wrong wrong wrong it’s in context. You’re wrong again.